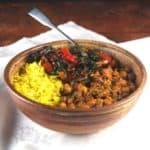 South Indian Chickpea Curry - Vegan Recipes - Holy Cow! 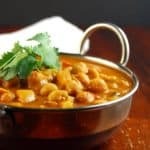 This Chickpea Curry is really a south Indian-style Chana Masala recipe, with a few additional ingredients that give it a distinct identity all its own. And it smells so good, you are going to be eating it by the ladleful, straight from the pot. 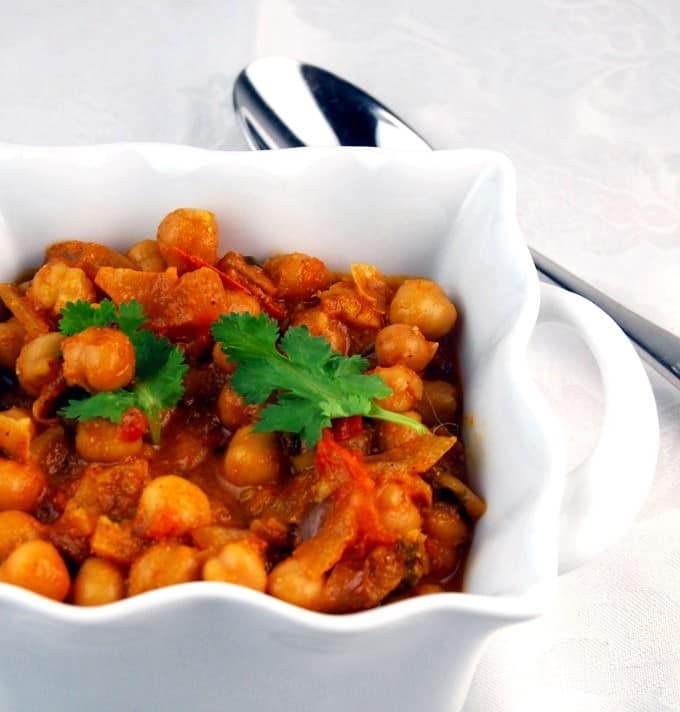 I love chickpeas — who doesn’t — and Chana Masala is a perennial favorite hereabouts. 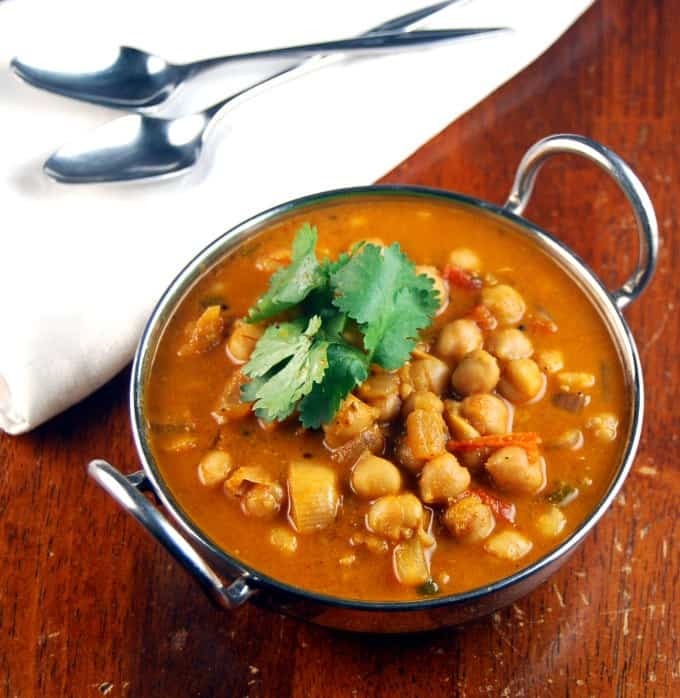 But this time I wanted something slightly different than this beloved Indian chickpea recipe. It had to be utterly fragrant, not too spicy, and simply divine. Into my south Indian Chickpea Curry went some spices, like fennel seeds, which adds a sweetness and complexity prized in Indian cooking. Some fenugreek seeds, for that undetectable, bitter yin that makes so many south Indian dishes so gorgeous. And, of course, some coconut, because no decent south Indian would leave it out. I am always a little nervous when I serve Jay something new. Although his eating habits have improved drastically since we first started, and he is actually eating most of his meals in less than 30 minutes, there is a lot that he still won’t eat. In fact,with most new foods, he will stare at the plate dolefully for a full five to 10 minutes before he will even try a spoonful. But this Chickpea Curry went down in a hurry. In fact, it took him under 10 minutes to polish off his plate and ask for seconds, which was a record. Part of it, I am sure, was that incredible fragrance. Did I mention that already? Here’s the recipe for my delicious and quite authentic chickpea curry. And do come back for seconds! 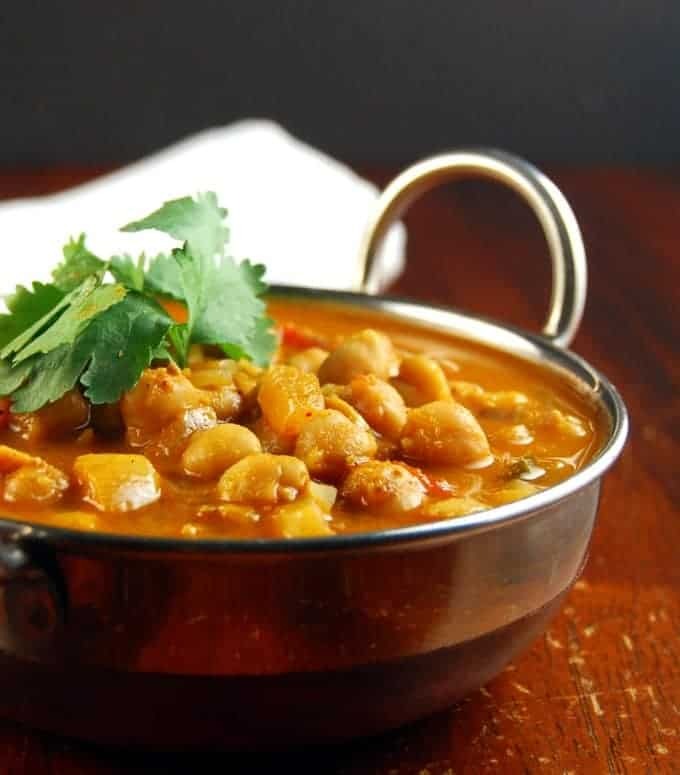 This Chickpea Curry is really a south-Indian-style Chana Masala recipe, with a few additional ingredients that give it a distinct identity all its own. And it smells so good, you are going to be eating it by the ladleful, straight from the pot. 4 cups boiled or canned chickpeas. Rinse if using canned. Make a powder of all of the masala ingredients, in a spice grinder or a powerful blender. Set aside. Heat the oil in a saucepan. Add cumin seeds. When they sputter, add the onions, curry leaves if using, ginger and garlic. Sprinkle some salt and saute, over medium heat, adding a teaspoon or two of water if the ginger and garlic start to stick. When the onions are translucent, add the tomatoes, paprika, cayenne, turmeric, and the spice mix. Cook over medium heat, stirring frequently, until the tomatoes darken and most of the liquid has evaporated. Add the chickpeas and salt and stir well to mix. Add 2 cups of water. Bring the chickpea curry to a boil, turn down the heat, and simmer for another 10 minutes. Add the coconut milk and let it warm through. Add salt. Garnish with leafy coriander and serve hot with rice. Hi Vaishali, great curry as always. This one remembers me the food from Goa that i really like! In which step you add the Coconut milk ? Thanks, TVJ. Hope you try! Thank you for this recipe. I really like the idea of adding coconut milk into this dish. I will try it next time, I make it. Thank you for your blog. I do follow it. 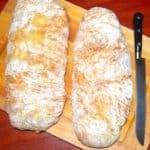 It is an inspiration for bloggers like me, to take make better presentations of our cooking skills. Really loved the way you have presented the ingredients list, in the dotted box. Do you use a software to get that design? what kind of tomatoes do you use please? I’ve been reading your blog for years. 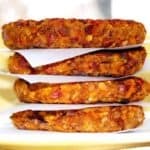 I have a plant-based kitchen at home (but still enjoy cheese once a month or so, so I’m not vegan) and just finished an online cooking class through Forks Over Knives. 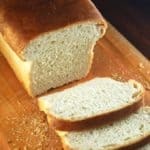 I just used this recipe and it turned out great. I did a few substitutions that didn’t seem to alter the intent of your recipe–used a dry saute technique to eliminate the oil. (I know, sounds awful, but it works.) Chana Masala is my favorite on the buffet and now at home, too! How exciting! Thank you! Hi, that’s wonderful– I love this chickpea curry and so glad you did too. I don’t find the idea of dry saute awful, because I often water-saute myself, although I have yet to try a dry saute. Thanks for letting me know it works in this recipe. I made this chickpea curry today. I had no potatoes so I substituted with sweet potatoes and it was delicious. My girls could not get enough of it 🙂 Thank you! That was delicious! I have never made my own masala before. Sooo worth it. Best homemade chana masala ever! I am new to cooking Indian food… I don’t think I could get methi and fennel seeds in time. 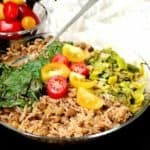 Would it be horrible to to use garam masala spice instead of the spice mix? Lyana, garam masala is fine. Since garam masalas can often differ widely based on brand, and some are spicier than others, I’d say use 2 tsp first and then add more if you think it’s needed. im not that great at cooking but indian food is my absolute favorite and i want to start eating a more plant based diet. i shall pick up the ingridients next time i go to the supermarket and give it a try. luckily there is a nice indian market by my house for what i cant find at the supermarket. I’m curious if I can use my already ground spices instead of purchasing whole to grind at home. Do you know the amounts on ground spices vs whole? Or I have garam masala, is that what is being made by grinding the whole spices? Hi, this is one amazing dish! Was looking for a coconut gravy without tamarind,wanted to cook Chana with tendli and used this recipe to do exactly that…. 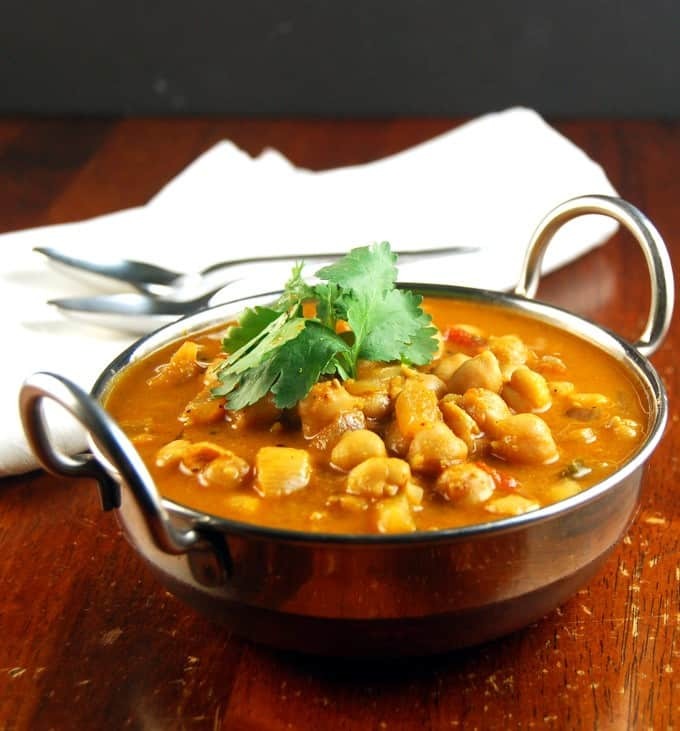 Our favourite Chana recipe!! I’m abit confused about the coconut milk. Is it canned such as the Thai coconut milk or the ones in the carton? Thanks. Yes in a can, like the Thai coconut milk. 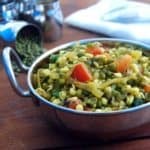 I’ve tried multiple chickpea curry recipes and this is by far the BEST! My roots trace to all over India and my husband is African. I’m totally vegan and my husband is mostly vegan so finding tasty veggie meals are tough. 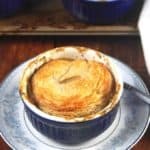 I’m so appreciative of this recipe. I usually make my own masalas as most recipes call for it but this masala is BOMB! What great flavours. Thank you! Very nice recipe. Tried it today.. Made a few changes, dry roasted the spices before grinding them to a powder. .. Thanks for sharing. good recipe, we used to eat lots of chickpeas, as we grow, but this one I will experiment with puri tomorrow for brunch. good vegan curry. love it. This was simple and fabulous! Only thing I changed was that I only had about 2 1/4 c. chickpeas, but it turned out great. Thank you! This is my favorite curry and adding coconut milk is my choice too. Adding 1 to 2 tablespoons of lemon juice in the end makes the curry more refreshing. If green chilies are added, lemon juice certainly makes the dish tastier. This is now the only Chana recipe I make, cannot go back to the store brought Choley/Chana masala after making this masala from scratch and nor can I imagine Chana curry without coconut milk which adds a heavenly creaminess (it is always home made for me, since coconuts are cheap and easily accessible). There is something very satisfying about this dish. Works equally well with Jeera rice or roti. 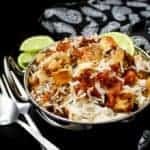 I usually quadruple the recipe for the dry masala and almost always end up giving it away to friends /extended family who happen to taste this… Thank you so much for sharing. 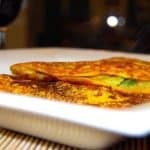 Hi Radhika, so happy to hear that, because this is a favorite recipe of mine too. I tend to mix up my cooking a lot, partly because I keep experimenting for the blog :), but this south Indian Chana Masala is one recipe I make over and over. Great idea to make a big batch of the masala. 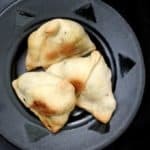 I was craving these and this recipe is a slam dunk! Thank you. Thanks for the great recipe with chick peas! Waiting to try out! Always made vegetable curry but never with chick peas! Thanks!